This index page links to stories of the people and places in the Big Creek Drainage. “Nape Edward’s wagon is what they used to call a ‘Hack,’ a light, get-there-quick-type of wagon, sort of a poor man’s buggy.” – Ron Smith. Big Creek Lodge is a little over a mile down river from Edwardsburg, the road connecting the two locations was built in the 1930’s. 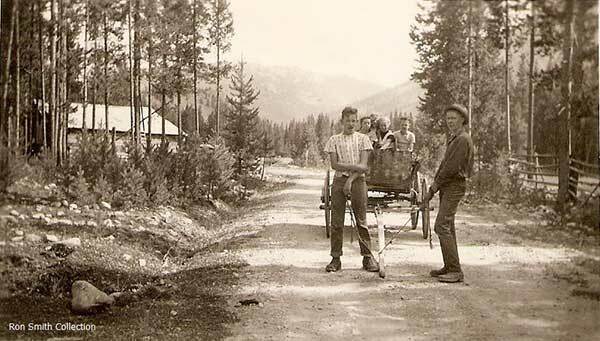 Deep in the heart of central Idaho, the isolated community of Big Creek was once the sole province of miners, Forest Service personnel and eccentrics. Today, the hodgepodge collection of homes on the boundary of the Frank Church River of No Return Wilderness still remains a destination for those who want to get about as far away from city life in Idaho as possible. We travel the rugged roads to Big Creek to talk with those who have thrived on its remoteness, including 100-year old Wilbur Wiles, who used to live there through the deep winters; Earl Dobbs, the first wilderness ranger in the area; and two backcountry pilots who forged a deep relationship over their mutual love for Big Creek. Link to Harry Shellworth Album Idaho State Historical Society, photographer Ansgar Johnson Sr.